The product either doesn’t work or it irritates my skin and gives me itchy rash on my armpits. After the first pregnancy when I realized this had become an issue I used Mitchum Roll-On for quite a while until I got sensitive or allergic to some ingredient in it. My armpits got red rash and they were itching like crazy. I used something else for a while and the rash went away. Then I tried Mitchum again and same thing happened. So there started my quest for finding a perfect deodorant or antiperspirant. I have tried heavier duty stuff like Triple Dry and other similar products. Triple Dry surprisingly didn’t irritate my armpits but it didn’t work either. I was still sweating and there was bad odour. I used it long enough to give it time to work but no. Also the amount of sweating is not my problem, the odour is. So no need for a product like Triple Dry anyway. I have tried several different very gentle, natural cosmetics deodorants. I have tried countless drugstore ones. Some of them worked for about two weeks and then they just didn’t work anymore. So much trial and error that I have lost count of the products I tried. Then I read a blog post about Secret antiperspirants. First one I tried was pH Balanced Spring Breeze one and it worked. I was so happy to finally find something that keeps the odour away, doesn’t smell too strong to be noticeable over my perfume and didn’t irritate my skin. I used that for a while but I got tired of the scent even if it wasn’t too strong. Next I tried Secret Outlast non scented one. That worked for me too but I ran into another problem. They don’t sell Secret products here in Finland and I had to go to eBay to order these. Next I couldn’t find a reliable seller who shipped to Finland for a reasonable shipping cost. I found one that sold a different Outlast one. I have forgotten the name of that antiperspirant but it did say Olay on the package. To my surprise that didn’t work. So back to eBay I was. After that I found the Coconut Splash one. I ordered one to test it out and I was so thrilled that it worked. I love, love coconut! One of my favorite scents ever! I also found a seller who shipped from UK for a very reasonable price so I ordered a few backups too. So here we are. I have used this for a few months now. It still works great! No skin irritation at all and no bad odour. The scent of coconut is there but it’s very subtle and goes away after a while. This is really a perfect product for me. 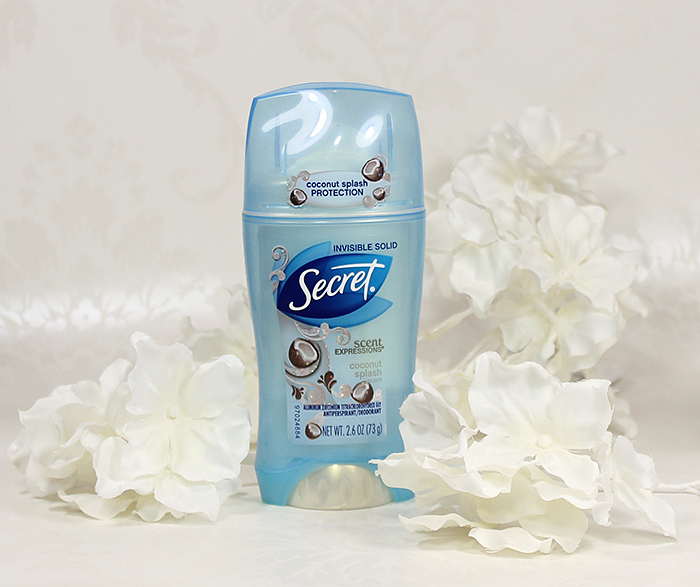 Have you tried any Secret antiperspirants? Do they work for you? I own a Secret antiperspirant and absolutely love it! I have really liked all of them that I’ve tried except for the Olay one. I use Secret as well! I love the clinical one. It’s super long lasting. I will use Secret every once in a while. Right now I’m on a Dove kick. I haven’t been able to find a Dove that works for me. Tried a few of those too. Finding the right antiperspirant that works for you is always amazing! It really is :) You can feel much more confident when you don’t have to constantly be afraid of your antiperspirant/deodorant failing you.